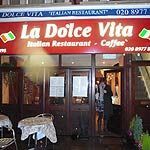 La Dolce Vita offers a wide selection of traditional Italian fare from its location in Teddington. Do you work at La Dolce Vita? What did you think of La Dolce Vita?